Mother's Day is sneaking up again this year! Several friends have started conversations about Facebook about the things they've done to their mothers that make them deserving of fabulous gifts! I can honestly say nothing comes quickly to mind for me. I mean, everyone steals their mom's car at some time, right? I've been a pretty typical kid. I'd say I put her through more now, when hubby is called away to work and I'm DESPERATE for someone to watch my kids so I can pretend I have a life sometime. Mom (and dad) live an hour or so from me, but they usually come through. THANKS!! Perfectly Posh just announced their wonderful Mother's Day products yesterday. Our new Tickled Pink fragrance is a sweet, juicy cherry vanilla that mom will LOVE! The bundle includes a face mask, Big Fat Yummy Hand Creme, lip butter, and special commemorative pin for $42. Sales of this bundle will help donate more of the bundles to military caregivers through the Fisher House Foundation and Blue Star Families. Consultants with Perfectly Posh are even invited to sign up to help with delivery of the bundles to the charity locations. It's a great focus, as many military wives and mothers also find something just for 'them' in direct sales. The items are also available separately, except for the special pin. 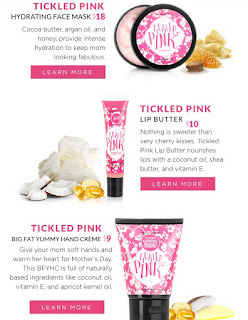 The hydrating face mask is $18; the lip butter is $10, and the Big Fat Yummy Hand Creme is $9. If you haven't tried Posh yet, this is an excellent introduction for you or mom to the naturally-based, made in the U.S.A. products. Regular items are $25 or less, and with the exception of our Mother's Day bundle and our $4 lip balms, everything is Buy 5, Get 1 FREE! All of these exclusive items are only available while supplies last, so you'll want to order yours ASAP! Shipping is available anywhere in the U.S. for just $5. Visit http://becki.po.sh for more information and to complete your order. I live that you're supporting military families and products are made is USA. Sounds like a great gift that my mother in law would love!